Victoria, Mahe (Seychelles) – August 27, 2018 (travelindex.com) – Seychelles was this last week recognised as sitting firmly amongst the 30 Most Magical Islands on the Planet. Congratulations to Eric Boulanger, the General Manager of the resort for having had his property make that list and to fly the Seychelles flag so high. The good news for Seychelles tourism is that this report by Ashley Moor comes out just as the Seychelles’ hospitality industry is again being thrown into the spotlight with five Seychelles resorts being bestowed with a prestigious travel award in China. As we say congratulations to these five resorts we must note with interest that it is always those properties who are visible that remain relevant. 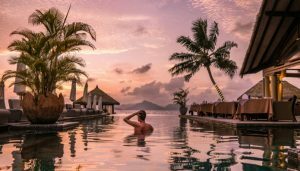 Today it is congratulations to Four Seasons Resort Seychelles, Fregate Island Private, Maia Luxury Resort & SPA, North Island and Six Senses Zil Pasyon, for being featured among the recipients of the 2018 Conde Nast Traveler China Gold List awards. Seychelles has left behind the day when key economic industries were coconuts, cinnamon or vanilla. For many countries it is still industrialisation that is their current “buzzword”. This gives these countries the chance of hiring a massive workforce as they convert raw materials to finished products for sale, providing exports for the country. The size of the Seychelles and its limited workforce, moved the islands to embrace tourism, ever since the opening of the international airport in 1971. Governments collect a substantial amount of revenue through direct and indirect taxes from industries in countries where industrialisation is the name of the game, which ensures at the same time, their ability to provide employment for their people. Daniel Marandu writing in The Citizen of Tanzania is nowadays joined by many a writer to refer to the era of industrialisation as the coal-era, as they go further to describe the world of today as the cool-era. This is because the world is living in an era where artificial intelligence embedded in machines have replaced the majority of the workforce as we also sit preoccupied with re-imagining the future. These experts believe that if industrialization is to connote significant opportunities for the workforce, then today the service industry and knowledge economy must be part of that future “industrialization”. David Marandu says that in Africa, right in front of us stands the hospitality industry with endless opportunities, and yet the Eiffel Tower – a manmade steel structure – attracts more tourists (about 7 million annually), admittedly for a very short time period, than our country does (1.5 million tourists annually) notwithstanding the well-known attractions. A recent PwC publication Hotels Outlook: 2018-2022, provides an overview of the trends and prospects in the hotel industry in South Africa, Nigeria, Mauritius, Kenya and Tanzania, and identifies some of the challenges for the hotel sector. The report highlights that room revenue in Nigeria and Mauritius showed double digit growth, but Kenya and Tanzania showed declines in revenues. The decline in Kenya was a consequence of political challenges following the Supreme Court overruling of the August presidential result, though by December tourist arrivals had rebounded. For Tanzania, it identifies a drop in guest nights in 2017 as resulting in a 5.5 per cent decrease in room revenue compared to 2016. The report links this decline to various regulatory changes (including the introduction of 18 per cent VAT on tourism services, increased in visa charges for business travel to $200, fixed-rate concession fees for hotels in the national parks – some as high as $59 per person per night), and Government austerity measures. Looking forward for the next five years, the report projects that hotel revenue growth in Tanzania will rebound and show compound annual increases of 9.1 per cent per annum (marginally behind Kenya (9.6 per cent), but ahead of Mauritius (7.2 per cent) and South Africa (5.6 per cent)) boosted by faster growth in global GDP, more flights and new hotels; but at the same time it notes that higher taxes and rates will remain an impediment to growth – implying that growth would be even higher still were it not for these challenges. The report notes that over the next five years, seven new major hotels are expected to open in Tanzania (including Rotana, Anantara, City Lodge, Hyatt Regency, Sarovar Portico and Ritz-Carlton) adding 900 rooms by 2019 and 1,200 by 2022, a 16 per cent cumulative gain. This will increase room revenue from $206 million in 2017 to $319 million in 2022 at a projected occupancy rate of 58.5 per cent. This shows that when investments are coming in, it is a good sign and expectations are high in the industry. Knowing that visibility does not come free and one has to pay for it, has prompted many now to embrace “Data analysis and digital marketing” and in so doing, remaining visible and relevant. One tool to better understand the tourism market, is big data analysis and digital marketing. The current data gathered does not indicate the number of visitors by country, geographical location, age, income bracket, travelers’ feedback et cetera. Collecting the right data will result in accurate and appropriate strategic decisions made from useful information. For example, are the interests of a 20-something tech enthusiast backpacker the same as those of a 60-something pensioner visiting the country? Collecting the right data will enable specialized service offerings leading to diversification and growth in revenue streams. A reduction of costs, specifically taxes and fees, which as an example make Tanzania an expensive destination, could also help. In Seychelles airport handling charges, electricity and water charges as well as an across the board VAT on hotel bills for services and room amalgamated together. A reduction in these costs would most likely be offset by increased other direct and indirect taxes generated from the additional economic activity resulting from increased number of tourists. Another opportunity is to continue to diversify the product. Examples from countries who have taken this step include India (with medical tourism, worth around $3 billion), Singapore (as an educational and a tech-hub), Latvia and Israel (with agro-tourism) Rwanda with business tourism and conferencing, to earn tourist revenues other than the traditional excursions and beach destinations. Its time for Government and the private sector to ensure they are supporting industries integration in the sector. The sector should ensure most of purchases are locally sourced which will increase domestic production and boost supporting industries, obviously with no compromise on quality. This will result to a huge multiplier effect with a positive effect to the economy. Lastly, local skills and quality of service should be at the top of the agenda to ensure the country hotels and tour companies can compete at the global stage. There is a need to have trained professionals who provide quality service to ensure customer satisfaction – from coffee shops, restaurants to hotels. There is a cry out there that our customer service is poor and displeasing. The tourism industry is already a top foreign currency earner – but imagine the even greater economic contribution that it would make if we moved the goal posts on visibility, costs and believing in Seychelles, in the Seychellois and in what is produced in Seychelles. This is the prudent path forward for Seychelles and its President. Africa is the second largest Destination for French Tourists but Seychelles? France has traditionally been the most important tourism source market for Seychelles. The islands enjoy a direct non-stop service with JOON of Air France and it is known that Africa today is the second largest tourism destination for French Tourists. A recent report by Business Analyst 24 provides a thorough insight into the country’s domestic and outbound tourism industry. The report shades light into the profiles of French tourists and summarizes the key reasons why they travel. The report offers an in-depth analysis of traveler flows, spending patterns, main destination markets and current and future opportunities for tourism businesses seeking to tap into the French outbound travel market. France is one of the most valuable tourist markets globally and French tourists are considered sophisticated travellers. In particular, France is the 10th largest market in the world in terms of the size of its outbound market and ninth in terms of the size of its domestic market. Following several years of stagnant economic growth, the outlook for the French economy is positive. Increased consumer confidence is expected to be translated into more international trips; outbound travel is set to grow at a CAGR of 1.5% between 2017 and 2022. – Outbound travel is expected to grow at a moderate CAGR of 1.5% between 2017 and 2022. – Domestic travel will recover by 2020, but then will decline as the French are forecast to favour international trips. – Europe is the destination of 80.6% of outbound French travellers. – Africa is the second most visited region by French visitors. – As the economy is set to grow, businesses are looking for internationalization opportunities, boosting business travel. – As more players are entering the long haul low cost segment, competition in aviation is set to intensify. What does Seychelles need to do today? Germany is now once again the main tourism source market followed by France in second place and followed in third place by the UAE. Fitsum Arega, the Chief of Staff of Ethiopian Prime Minister Abiy Ahmed, has been appointed as chairman of the national tourism board. The appointments fill the vacancy after former Culture and Tourism Minister Hirut Woldemariam sacked the entire board back in April, only to pay the price herself when she was moved from the increasingly important portfolio less than two weeks after she took the controversial decision. Also on the board is the CEO of Ethiopian Airlines Tewolde Gebremariam, the chair of the Addis Ababa Hotel Association Biniam Bisrat and Yacob Melaku, chair of the Ethiopian Tour Operators Association, among others. The new Minister for Culture and Tourism Bizunesh Meseret also serves on the board. Lensa Mekonnen was appointed as CEO of the ETO and took office on the 06th of August.